Unless your bed is against the wall, it should have a clear 36 inches on all sides for you to make your way around it. Within that border, measure the length and width of where you imagine you’ll place your new rug. You can lay out masking tape or a bed sheet in its place, or you can read our Ultimate Area Rug Size and Placement Guide to find your fit. The best bedroom rug should extend at least 2 feet beyond the edge of your bed so you feel like you’re scooting right into your fuzzy slippers when you throw your legs over the side. Add a foot to your rug’s length if you have a trunk or bench at the end of your bed. For small bedrooms where furniture space is limited, you just need the legs of your footboard to reach your rug, unless you opt for runners on the sides. Runners cost less, they’re a bit more visually intriguing, and they ensure you’re not paying for rug material you won’t even see. For larger bedrooms where you might have room for a seating area, desk, or vanity table, use several area rugs to set apart those spaces. Speaking of setting apart your space, your bedroom is your sanctuary, especially if you have roommates. Choosing the right style for your area rug should be about personal preference and balance. This is your bedroom, where you don’t have to worry so much about foot traffic. You should be focused on luxury and comfort. So if you’re thinking of splurging on that soft, fluffy sheepskin throw, this is the room where it can be justified. If you go big in your bedroom rug, go neutral. You don’t want a giant swath of fabric so glaring that you don’t need an alarm clock to wake up in the morning. Take cues from your bed frame’s upholstery, your nightstands, or your bedding. If most of your master bedroom is upholstered in a solid color, it’s a good idea to choose a lively pattern, like you’d find in Paisley and Oriental rugs. Smaller rugs can be bolder. If the room itself is small, try a bedroom rug with stripes. Stripes elongate your room, pulling you in and compelling you to climb into those sheets. For rooms adorned with artwork and patterned print comforters, a solid low-pile wool rug is is an excellent solution, but don’t be afraid to mix and match patterns together. For bedroom rug inspiration, read our full guide to Common Area Rug Styles. Along with colors and styles, area rugs come in a wide array of materials. The thinner and bumpier the rug, the easier it is to clean. 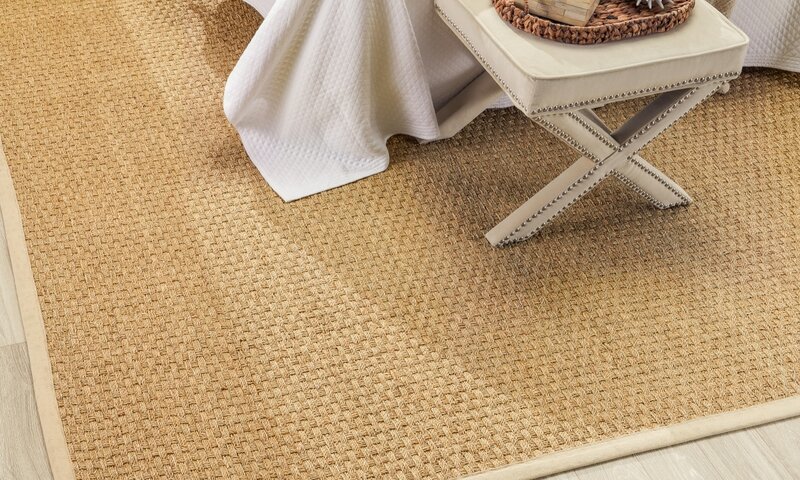 Sisal rugs are some of the best bedroom rugs for floors that get substantial use. It’s pretty much the only coarse natural fiber you’ll want for a bedroom rug. Your feet will thank you. While your feet are not likely tracking dirt all the way through to your bedroom, unless you’re in a small apartment, your pet definitely is. Silk and viscose rugs look nice and add shimmer to your room’s decor, but if your pet sleeps in your room, they won’t take long to show wear. So if you have pets, avoid absorbent rugs in the bedroom or ones with continuous loops that’ll snag on claws. Polypropylene rugs and wool area rugs are extremely durable, easy to clean, and simple to maintain. So when your drink on the nightstand spills or you’re eating pizza in bed and a slice lands sauce-side up, your floor will be braced for stains. Polypropylene backing generally eliminates the need for a rug pad, so you’ll be less likely to slip or trip. To prevent fading, you want a rug material that can weather all seasons, not just the gloomy ones. However, if your bedroom gets a lot of sun, you can also close blinds during the day to lengthen the life of your rug. Generally, nylon, cotton, and polyester won’t need to be replaced often, and won’t bankrupt you when they need to be switched out. Even when you’re spending your first night in a new place amidst boxes, a rug is a shortcut to creating a homey vibe. When looking for an area rug for your bedroom, it’s best to shop for that item before you purchase other coordinating accessories. The perfect rug that coordinates with your decor can provide a huge impact that ties all the elements of style together, but if you wait until that last throw pillow is added, you may spend months locating the perfect rug to coordinate with your decor. The good news is the best bedroom rugs are chameleons. A shag rug can transition from retro Mid-Century Modern style to a bohemian Moroccan import when paired with the right accessories. Neutral patterns can slide between coastal and shabby chic because they keep things light and airy. When you’re trying to give a bedroom character and complexity, start with a rug. The final thing to consider when selecting a bedroom rug is the backing material. 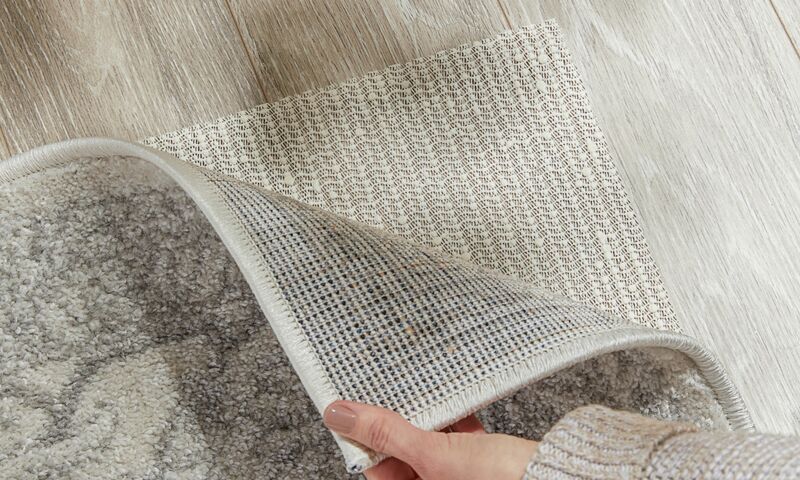 If you place your rug under a TV console or your bed frame, you don’t worry as much about it slipping, but a rug pad can add even more traction and much-needed padding. Bedside rugs should be secure to prevent accidents so a rug pad should always be a consideration. Opt for a rug pad that keeps your rug in place, or select a rug that’s slip-resistant if you’re installing it on solid-surface flooring. In addition to a rug pad’s many benefits, it will also give your rug some cushion. 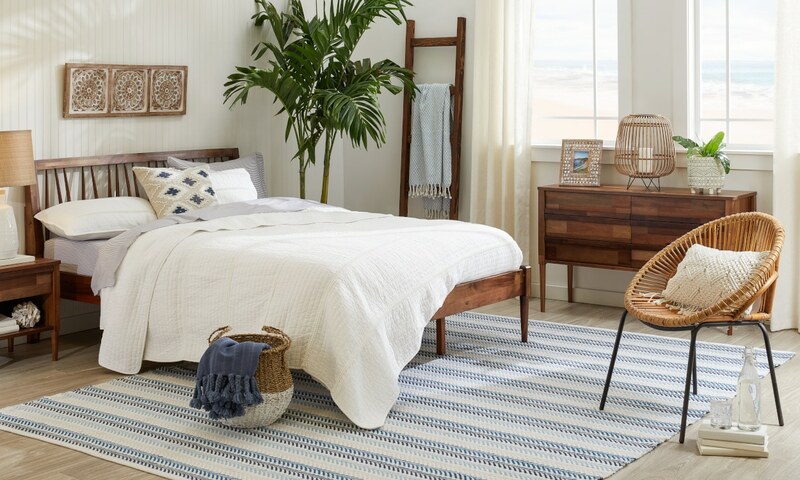 Nobody wants to leave the comfort of their bed first thing in the morning, but the best bedroom rug will start your day off right, as soon as your feet hit the floor. Bottom line? A rug pad is a purchase you’re not likely to regret. Something missing in your space? Throw down a rug instead of lots of moolah. Get inspired with rug ideas in every room in our Complete Guide to Choosing An Area Rug.